High levels of tree pollen this week could cause problems for asthma and hay fever sufferers in the UK. Trees in the UK have been releasing pollen since February, but the warm and sunny spring weather heading our way this week will cause a big spike in the levels. 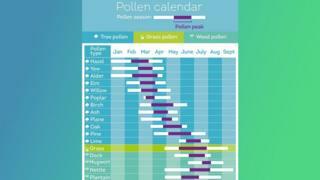 Tree pollen season runs from February to July, but peaks around April-May. Asthma charities are advising people to keep their inhalers with them at all times, and to take preventative medicine if needed. Around 3.3 million people with asthma are affected by pollen, and around 13 million people in the UK suffer from hay fever. The National Pollen and Aerobiology Research Unit helped to research when peak pollen seasons will occur. What is pollen and why is it a problem? Pollen is a type of fine powder which is released by lots of different plants and trees. It has proteins in it which can cause hay fever sufferers, and those with asthma, to get a runny nose, eyes or a sore or irritated throat. These symptoms can be much worse for people with asthma, and can trigger asthma attacks, wheezing, and shortness of breath. The best way to tell the difference between a cold and hay fever, is that with hay fever, you are more likely to get itchy eyes, and your nose will constantly stream clear snot. 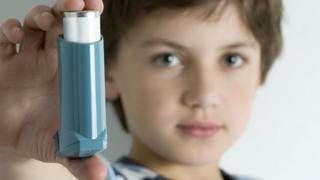 Special inhalers are commonly used to manage asthma. A reliever inhaler (usually blue) will help to relax the muscles around the airways to make it easier to breathe again, while preventer inhalers (usually brown or orange) help to soothe and calm the airways. How can you help prevent the symptoms? There is no cure for hay fever or asthma, but they can both be managed in lots of different ways. People with asthma can use inhalers, which allows them to breathe in special medicine, so that it reaches their lungs quickly and helps them to feel better. For people with hay fever - medicine called antihistamines or steroids can sometimes be used to help prevent a reaction and reduce the swelling. 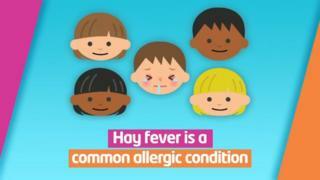 What is Hay fever? - and how does it affect people? "Take your prescribed preventer medicine to soothe your irritated airways so you're less likely to react to the pollen trigger. Take hay fever medicines such as antihistamines as they stop the allergic reaction that triggers asthma symptoms and keep itchy eyes and runny noses at bay. Everyone with asthma should keep their blue reliever inhaler with them at all times in case of an emergency." You could also keep a pollen diary, marking down when you suffered from hay fever symptoms, so that you can be more prepared the next year. However, it is always best to talk to a doctor about what is right for you, if you think you might have hay fever or asthma. World Asthma Day: What is asthma? Hay fever: Where can you go to avoid a runny nose and itchy eyes?